The British colony of New South Wales was founded in 1788. In those days the Latin language was still widely used in the sciences, in law, in medicine and in inscriptions on building foundation stones, on memorial tablets, and on graves and tombstones. In Sydney, the capital city of New South Wales, the following inscriptions in the Latin language -- testimonies to the hard work and achievement of past generations -- can still be viewed at just a short distance from the Central Business DIstrict. FRA. FORBES CAPIT JUSTIC. COLL. PRAES. E. Hallen. Arch. R. Cooper. Aedif. when Richard Bourke was the Governor of the territory. Some of the Latin words in the inscription have been abbreviated for reasons of space (for example, GUBERN. is short for GUBERNATOR (English, "governor"). The Sydney Grammar School opened its doors in 1854 and is still a major Sydney school to this day. The stone tablet with its Latin inscription was placed above a doorway in the western façade of these buildings in 1832. "Hallet's original design included a long western facade with a central entrance with a handsome portico with columns. Unfortunately the portico was never constructed." Above the doorway, now walled-in, a stone tablet with a Latin inscription was placed and this stone tablet is the one we can still see today. During the term of an early N.S.W. Governor a tablet was erected on the building in College Street occupied by the Sydney Grammar School. After all these years the sandstone is fretting, but the wording is in Latin. Could any of your readers, many of whom pass the place on the way to the Museum, give the English version of the inscription? "UNDER THE AUSPICES OF THOMAS BRISBANE, KNIGHT, SYDNEY COLLEGE WAS ESTABLISHED BY THE SOLICITUDE OF AUSTRALIAN CITIZENS FOR THE STUDY OF LITERATURE AND THE LIBERAL ARTS. FRANCIS FORBES, CHIEF JUSTICE, PRESIDENT OF THE COLLEGE.. RICHARD BOURKE, GOVERNOR OF THE TERRITORY 1832. E. H. ALLEN [sic], ARCHITECT. R. COOPER, BUILDER." of the main entrance door of the Royal Prince Alfred Hospital's original building. The foundation stone of the Royal Prince Alfred Hospital was set in place in 1876. It may still be seen on the right hand side of the main entrance of the original Royal Prince Alfred Hospital building between the Prince Albert Pavillion and the Queen Victoria Pavillion. saved him for the Queen his mother and all the Britons. while his Excellency Sir Hercules G. R. Robinson, G.C.M., was Governor of the Colony. Some of the Latin words have been abbreviated for reasons of space (for example, DEO OPT. MAX. is short for DEO OPTIMO MAXIMO (English, "to God most great and most high"). 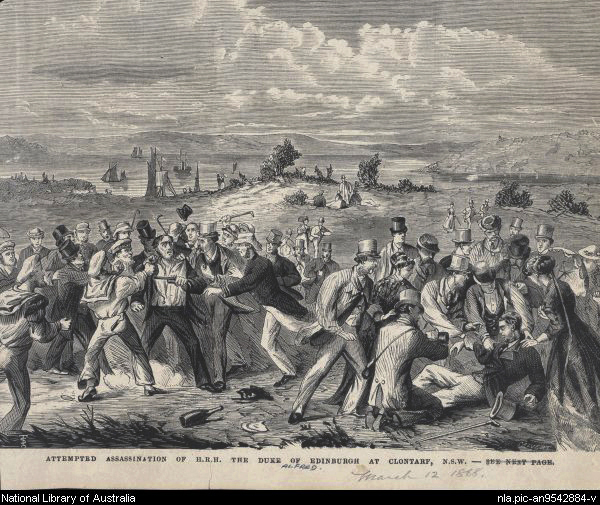 A contemporary engraving of the "Attempted Assassination of H.R.H. the Duke of Edinburgh at Clontarf, N.S.W." There is a granite memorial tablet located a few metres to the south of St. John's Anglican Church, 120 Darlinghurst Road, Darlinghurst. The stone is built into a section of the brick wall that marks the dividing line between the land around the St. John's Church Rectory and the land around the St John's Hall and Office. The Latin sentence may be translated as: The end crowns the work. (or, loosely translated into modern colloquial English, The final results justify all the effort expended on the project). Given that there is currently no "St. John's School" in Darlinghurst, what does this inscription refer to and what is the story behind it? There has been an Anglican [Church of England] presence since 1849 at and around the current site of St John's Darlinghurst. The first building at the site was a parish school/hall that was constructed in 1849 and known as St John's School and St John's Hall. That building was used as a school throughout the week, as a place of worship on Sundays and as a meeting hall on other occasions. The granite memorial tablet is believed to have been originally created and placed on or beside that 1849 parish school/hall building. In those early years a new sandstone church, known as St John's Darlinghurst, was slowly built just to the south of the school/hall. The spire was added in about 1871-73. At some point church services began to be held in the new church building while the 1849 building continued to be used as a school and a meeting hall. It is believed that the granite memorial tablet was removed from the 1849 building when it was demolished in the early 1960s. The tablet was relocated to a brick wall separating the St John's Rectory and a new Community Hall located just to the south of the St John's Darlinghurst church. The memorial tablet remains in that spot to this day. When the 1849 building was demolished, the school ceased operating and the hall functions moved to the a new brick building known as St John's Hall and Office (built south of the church and dedicated by the Right Reverend Marcus Loane in 1966). The Writing on the Wall: The Greek and Latin Inscriptions of the University of Sydney by Kevin Lee and Anne Rogerson. Sydney, The University of Sydney Publications Office, 2002. Introduction by Dexter Hoyos. 1. Clifford Turney, Grammar: A History of Sydney Grammar School, 1819-1988. Sydney, Sydney Grammar School in association with Allen & Unwin, 1988, p. 14. 2. ibid., p. 426, footnote 82. 4. Royal Prince Alfred Hospital: 125 Year Anniversary. Sydney, Royal Prince Alfred Hospital, 2007. p. 19. 6. R. P. A. [journal], September 1938, p. 42.